Radioactive iodine (radioiodine or I-131) is used in the treatment of hyperthyroidism which is the most common endocrine (hormonal) disorder to affect cats. Ten percent of cats over the age of ten in the United States are affected. The disease is caused by a benign, hormone-secreting tumour on the thyroid gland which is located in the cat’s neck; these hormones control metabolism and growth. Hills y/d is low in iodine, which is required by the thyroid gland to produce its hormones, low iodene=reduced hormone production. It can take a few weeks for this food to take effect. Methimazole or carbimazole which block the synthesis of thyroid hormones. Removal of the enlarged thyroid lobe(s), known as a thyroidectomy. In some cases, the parathyroid gland may be accidentally damaged or removed during this procedure, resulting in hypoparathyroidism. To destroy the tumour which is the focus of this article. Some of these treatments manage the condition (medications and diet), while others cure it (surgery or radioactive iodine). What happens if hyperthyroidism goes untreated? An increase in levels of thyroid hormones speeds up the cat’s metabolism (hypermetabolic state) which leads to a hyperdynamic cardiovascular state in which the heart beats faster which eventually causes secondary hypertrophic cardiomyopathy and congestive heart failure. Collectively called cardiac thyrotoxicosis. These are late manifestations of hyperthyroidism which highlight the importance of early diagnosis and bi-annual health checks in cats over the age of 7. 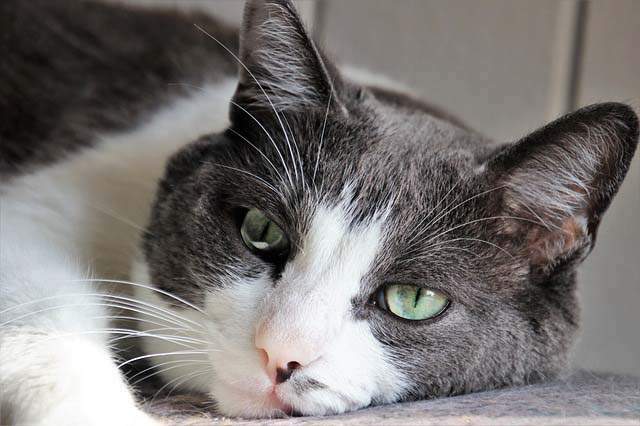 High blood pressure (hypertension) is another common side effect of hyperthyroidism in cats. Hypertension has a serious impact on several organ functions. Swelling and bleeding into the eyes can lead to retinal detachment and blindness. Other side effects include hardening of the arteries and an increased risk of stroke. How does radioactive treatment work? The thyroid gland uses iodine-which is in many types of food to make the thyroid hormones. Cats with hyperthyroidism have abnormal and hyperactive thyroid tissue as well as atrophied healthy thyroid tissue. I-131 is a radioactive form of iodine, which the diseased thyroid takes up. Penetration is only 1-2 mm deep, which spares the underlying healthy thyroid cells. Your veterinarian will refer your cat to a specialist veterinary centre for treatment. Are all cats good candidates for radioactive iodine treatment? Approximately 5.8% of cats will have both chronic kidney disease and hyperthyroidism. Hyperthyroidism leads to increased blood flow to the kidneys, which can mask kidney disease. Cats who are in poor health due to cardiac thyrotoxicosis are also not been suitable candidates for treatment. Baseline tests: These include biochemical profile, complete blood count and urinalysis to evaluate the overall health of the cat and determine how the liver and kidneys are functioning. Methimazole or carbimazole trial: As we know, these medications decrease thyroid hormone production and can unmask kidney problems before the cat receives irreversible radioactive iodine. Kidney function is assessed before the commencement of medications and then once again once normal thyroid function (euthyroidism) occurs. If kidney disease is revealed, the medication can be discontinued. If no kidney disease is unmasked, the specialist veterinarian can proceed with radioactive treatment. Electrocardiograph: A recording of the electrical activity of the heart to look for abnormalities. If found, an echocardiogram (ultrasound of the heart) will be necessary. Stop medications and/or special diets: The cat will stop methimazole (Tapazole) or carbimazole or Hills Y/D (a prescription diet low in iodine) 7-10 days before radioactive iodine treatment. The cat will receive a single injection subcutaneously (under the skin) of radioactive iodine. It is quickly absorbed into the bloodstream and taken up by the diseased thyroid tissue. Cats who are difficult to handle may require sedation before administration of radioactive iodine. How quickly will thyroid levels take to return to normal? In most cases, thyroid levels should return to normal within a week, although this may take longer in cats with reduced kidney function. How long will the cat remain in hospital? The cat will be in isolation for 3-8 days. 95% of the radioactive iodine is excreted via the cat’s urine, with lesser amounts through the feces. Exposure to radioactive urine poses risks to veterinary staff and caregivers; therefore careful removal of urine is necessary at an approved facility. Pet owners will not be permitted visitation during the cat’s hospital stay; however, the veterinarian will maintain daily phone contact with updates on the cat’s progress. Discharge occurs when radiation levels in the urine are no longer a risk to the general population. Note: If you choose to send the cat to hospital with an item of bedding or a favourite toy, it can not be returned due to radioactive contamination. Some cats can become temporarily hypothyroid (decreased levels of thyroid hormone) in the period after treatment, but this should resolve. Once discharged, additional precautions will be necessary as the cat will continue to have low levels of radioactivity. Pregnant women and children under 18 should avoid contact with the cat, its urine, feces, food bowls and toys for two weeks. Use rubber gloves when cleaning the litter tray. Avoid prolonged contact with the cat such as sleeping with the cat on your bed, or allowing the cat on your lap. Always wash your hands after contact with litter trays and the cat. Keep the cat separate from other household pets. Do not allow the cat outside for three weeks after discharge. Double bag cat litter and store in an outside location, in a well-ventilated space for a further two weeks, then dispose of in the garbage. This extra time allows for further decay of radioactivity. Do not allow cats to walk on bench tops, if they do, wash thoroughly with soap and water. Avoid contact with the cat’s saliva which contains a small amount of radioactivity. The veterinarian will schedule a follow-up appointment four weeks after treatment to check thyroid hormone levels, kidney function and blood pressure. What is the survival time of cats who receive radioactive iodine treatment? The median survival time of cats without concurrent kidney disease is up to 5.3 years. I was wondering where you are located.